Vanderbilt University Medical Center (VUMC) is the first in the state to enroll patients in a clinical trial testing the effectiveness of the newest implantable device used to reduce stroke risk in patients with non-valvular atrial fibrillation (AF), the most common form of arrhythmia. Patients with AF have an increased risk of stroke because blood can pool and form clots in an area of the heart called the left atrial appendage, or LAA. A clot can break free from the LAA and travel to the brain, causing a stroke. VUMC is studying a new implantable device designed to reduce stroke risk in people with non-valvular atrial fibrillation. For more than 50 years, oral blood thinners were the only intervention for reducing the incidence of stroke in AF patients. In 2015, the Vanderbilt Heart and Vascular Institute (VHVI) began offering the Watchman LAA occluder, an FDA-approved device, propelling the center into becoming the largest program in the state and Southeast region for LAA closures. 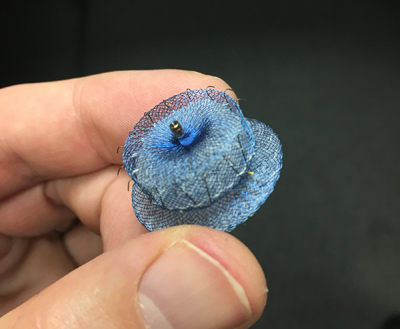 On Jan 17, the newest LAA device seeking FDA approval was implanted at the Heart Insititute as part of the AMPLATZER Amulet IDE trial. “This trial allows for the device to be studied head-to-head against the Watchman to test for its effectiveness in closing the left atrial appendage and preventing strokes,” said Christopher Ellis, M.D., associate professor of Medicine and director of Vanderbilt’s LAA Closure Program. “This trial will be able to provide the best data there is because it is literally device versus device. Vanderbilt is the only center in the state with open enrollment in the trial and one of 100 sites across the country participating in the randomized, controlled study. Ellis said prior to the approval of LAA closure devices, high bleeding risk patients had three options to treat AF: cautious use of blood thinners; aspirin only therapy; or open heart surgery, which is not a viable option for the majority of patients. Although blood thinners are an effective treatment, they carry a significant bleeding complication when used long term, Ellis said. Nearly half of AF patients eligible for blood thinners are currently untreated due to tolerance and adherence issues. LAA closure devices offer patients an alternative option. The newest device is a second-generation LAA occluder that comes in eight sizes to accommodate various anatomies. Ellis anticipates VHVI will enroll between 50 to 100 patients in the trial over the next two years, which places it in the top trial sites in the nation. The trial is expected to register up to 2,000 patients nationwide. The current trial participants were released the morning after implantation and will return at six weeks and one year for imaging and evaluation.